If learning these schools and styles is indeed your focus, one of two of the finest and most valuable books you can acquire is “ Thoughts on the Kentucky Rifle in its Golden Age .” This book is considered the manual by which most contemporary builders base their study upon. Written by Joe Kindig, Jr., annotated and published by George Shumway, it is a huge book and one of, if not the largest and most thorough studies available on schools of gunsmithing. This work was initially written as a pictorial of known original pieces. I don’t think it was originally intended to be used as it has been by builders. A gunmaker of these fine rifles needs the views which are normally not presented in the Kindig book. Belly views, top, wrist and buttstock enlargements as well as close-ups of forestock details are vital to show mountings, relationships and visual dimensions necessary for re-creating these weapons. Views of this nature are indeed available in another highly sought after two volume set of equal importance, known as “ Rifles of Colonial America .” This set and the first mentioned book are now available once again for a short time limited run. I highly recommend them to anyone interested in the gun history of our nation. And yes, I will offer them through our company as long as they are available. If you purchase no other books, purchase these. Always cut inside any drawn line on the wood. When inletting a breech plug, file an inletting draft on the sides of the plug. That is, the very top is wider than the bottom. That way, as your part goes down into the wood, it pulls down tightly into the mortise. Apply your black to the underside of the plug to show you where the wood is high. Use a scrap piece of barrel one size smaller than your present channel size. Wrap tight with emery cloth and overlap the excess in your hand above the scrap barrel. Lower gently into your barrel channel. Working very slowly and carefully, sand the channel, testing often until you can just get your new barrel down into the channel. Watch and don’t over-sand the top inside edge of the forestock. Get close and scrape out any high spots. When inletting a lower entry thimble, don’t let the optical illusion fool you. Inlet straight down and remove the bulk of material from under the tab where it joins the thimble sleeve. Work slowly and use inletting black. When you get close use a piece of ramrod to make sure of the fit, and keep inletting down until the rod slides in clean. Thimble exposure is not determined by what your stock maker provided you. It is determined by the style first. If no reference photos are available, a good rule of thumb is that 2/3 of the ramrod, when laying in the channel, is visible. When you inlet your thimbles the inside diameter must be flush with the bottom of the channel to aid your rod to slide cleanly into the stock. Use 2 pins to prevent thimbles from rocking and always 2 on the entry. Pre-bend the long belly tab slightly just before your final installation so that when you press the thimble into place, it is slightly under pressure when pinned. This will aid to hold that tab up beneath the belly of the lower forestock. After attaching your buttplate and rough filing to the shape of your buttstock, determine your lower flat width by the exposure on the sides of the lower triggerguard rail. Fit your toeplate, attach, and file the edges with the wood. When filing and shaping metal and wood simultaneously, always file from the wood to the metal. Otherwise shards may be transferred and damage your stock. Never pry or force lift a metal fitted part if its surface is below the wood. Always file metal flush with the wood surface first! When choosing a thread size, consider whether the option may exist to switch between percussion and flintlocks of the same plate size. Large Silers interchange as do L&R Late English and the L&R Leman, Mantons and Durs Egg locks. If you are doing this, then choose a 5/16”x 24 thread. This way you can use a 5/16-24 touch hole liner and enjoy the larger hole size you really need for the percussion drum. The latest stocks available through MBS are made to be used for a variety of schools of rifle. Many stock styles can be turned into one of a range of “original” representations. To keep up the quality, on our large combination of stock style and size, we have our stock shop process your orders when you order Expect as much as 4 to 6 weeks for delivery during the busy winter months. 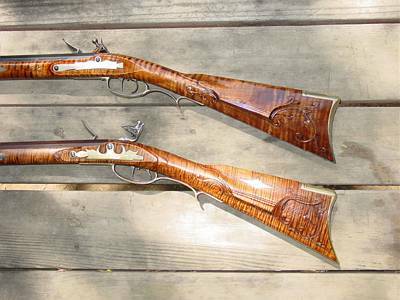 Un-plated oval headed wood screws are used to emulate those found in original rifles. Un-plated means you can easily brown, blue or harden without a common modern day plating that protects the screw from rusting. If you use hot brown to finish brown your screws quickly, multiple treatments will produce a darker and thicker finish. Oil thoroughly. I apply beeswax to a heated screw! Use a group of screws for your construction process that you replace with a fresh set as your final assembly. This gives the gun a better appearance. Heat treat the screw heads for longer lasting durability. Remember to make all your filings prior to the treatment since a file won’t cut a properly heat treated surface. This new bedding compound is unlike the old Microbed product (which is no longer available) in that it can be used for structural applications where MicroBed could not. An epoxy product draws a healthy line between a metal part and the wood and is structurally sound for use around the breech. For building a gun which you want to last as long as possible with good outdoor use and stand up to normal abuse, its use is an excellent practice. It will stop the moisture (sweat) which accumulates behind a metal part mounted in the wood from entering the wood, which causes the wood to mildew and subsequently degrade. It is not for purists, since it is not authentic. For those who want the best of both worlds, use sparingly and it will never be seen under normal circumstances. Use at the breech for strengthening, underneath permanent and semi-permanent inlays for inlet edges which are tattered or not a good fit, sideplates of locks and patchboxes where a large area may not be inlet level below the part, or where an inlet has been put too deep and the surface and needs minimal raising. This product is structural; meaning that it will stand up to shock underneath or beside the barrels breech, or in locations under stress such as wood screws, lock or tang screws. Use it with confidence, to fix irregular edges of inletting, and to stop moisture penetration! It is offered in a deep brown color, mixes equally one to one and hides well. Full cure overnight with 1 hour workability. Soft margarine consistency. Complete kit has release agent, stirring sticks, brush, thickening agent; everything you need! Comes in two wide mouth 2 ounce tubs for easy access. This stuff is easy to use and is very good. Acra Glass is a most underrated product. Acra Glass serves two major purposes. It was initially designed as a repair epoxy. It has fiberglass in it. The second purpose is the bedding of barrels. It provides such a stable solid and structural platform for your barrel that it has been proven as an accurizing product for serious competition shooters. We offer two types of Acra Glass. The original runny-as-water type, 2-Gun Red Label, has its own special uses and is well known as a professional builders choice for repairing fatal breaks, severe and minimal cracks, and adding on whole new sections in restoration projects. It is the number one selling structural epoxy for gun builders. This first type which heats to a temperature you cannot even stand to touch when it is setting up, is so thin it will permeate into any crack or crevice it is exposed to. Keep that first in mind. You must gate any location you do not want it to run into. I use bees wax to pack the threads in the back of the plug at the barrels breech. Do the same! Also, think in terms of a part releasing out of its bed. Don't leave any bevel that would trap your part. This is called 'inletting draft' when a bevel is filed on a parts side. The part pulls tight as it lowers into the wood but will release just as easily. Our kits come with black and brown dyes to mix your own color, mixing cups and instruction. AcraGlass Gel is of butter consistency and is not runny at all. In fact, you can spread it where you want it and use it more comfortably. I use both types for different applications. Easier to mix with 1 to 1 mixing ratio and more time to work. Fiberglass is already in the mix. Comes with brown & black dyes, mixing cups and complete instructions. Understand that wood grain is tubular in its structure. In the process of drying the lumber it has shrunk, but still retains this nature. When we work on our wood projects, the grain is like it is laying on its side when you are working it. The end of the tube grain is the “end” grain, meaning the ends of these fibers, and will always be darker. Therefore, you are always working with a portion of a tube like a half round pipe! This is where the bulk of your stain pigment is caught. When you leave a rougher sanded surface more pigment is trapped and the color will be darker. Pigmented stains consist of tiny pigment particles suspended in a liquid binder of either water or alcohol. The sanding process removes the rougher surface and makes the stain harder to take hold. This is where the type of stain you use comes into play. The pigment lays on the surface in open pores, scratches and any nook or cranny it finds. Stains are different depending on how you apply them. For example: Apply one stain and while still damp, apply another to its edge and watch the color change. With the same two stains repeat the process but wait and let the first coat you put down dry completely. Note the difference in the color as you lightly wipe the second color over the top of the dry stain. Now reverse the order you put the same two stains down and watch again! Amazing isn’t it?! In this way, I can’t imagine how many colors could possibly come from our stain group in this catalog! As long as stains are the same base, they can be applied this way. BUT NOTE: Do Not pour one stain into another. You will get mud! I know ‘cause I tried it! On most projects involving bending a part to a new shape, one must step back and think about the part in question. A “finished” trigger part has most likely been heat treated to make it more durable and lengthen longevity. Many times, we want to adjust the look of the triggers we are installing. That is a common practice. But if you are working with that finished set of triggers, the parts are heat treated and tempered. To bend a hardened part without breaking it you must first “soften” it. The technical term is annealing. A quick way to anneal steel is to polish the part first (so you can read color changes), then heat it to a purplish color and then let it cool slowly to room temperature. Do not immerse in any liquid. (There are two types of steel; one will use oil for quenching and the other uses water. You must know what steel you are using in order to properly cool the part in the correct medium when heat treating). A trigger which is a raw, as-cast part is straight from the foundry and is not ready for installation. It first must be filed for shape, fit to the assembled bar and test fit. Polish and sand the part to the appropriate finish. Only then is it ready to be heat-treated. The following is an attempt to explain the process of heat treating that is required for certain parts. First and foremost, it aint easy if you have never tried it before; but its not so hard that any individual with his mind made up to learn couldn’t get the hang of it. I do suggest you experiment with some “spare parts” before you actually start on the real thing. One way you will know whether you have successfully hardened a part is if your file won’t cut it. A-hah! You did it! Basically, the process of heat treating involves two operations. First to harden, which involves heating the part to the right stage and then quenching in the right medium; second, to temper or “bring down” the hardness to the proper hardness. Getting Ready for Hardening. For most of us who don’t have a full blown machine shop to spoil us (guess that doesn’t include me anymore), you will have to find a source of equipment to provide an open flame hot enough for the first step. Use an acetylene torch preferably, forge if lucky, or propane torch (pitifully inadequate), or MAPP gas (hotter than propane and readily available but will require using two to get enough heat on large parts). You will need some wire to hold the parts (which won’t draw out heat) and some light motor oil (the real stuff) in a can or metal bucket. Don’t skimp; you MUST submerge the part in the oil. Hardening. Attach the wire to each part to provide you with a good control handle. Heat the part uniformly to a bright red (about 1500 degrees). Very quickly immerse part in the oil and twirl around for about 30 seconds. NOTE: When you first immerse the part it WILL flame but will quickly go out. DO NOT withdraw until the part has completely cooled. This is deep hardening. At this time, the part is so hard it is brittle and must be “tempered” to draw some ductileness back into the metal. Tempering. A frizzens hardness must now be brought down to a RC 62-64 at 375 degrees; a pale yellow color on the parts exterior. Sears, tumbler and fly must be heated to 600 degrees, which is an RC 54-56 and will look full blue with some areas fading into gray over the parts exterior. Note: It’s a good idea to have a builders group of screws for the gun you are working on, and then your finish quality screws for the final assembly. Back file the slots so the slots are not perfectly vertical. They will release your screwdriver easier without fouling the top of the screw head. Then heat treat the screw heads of the lock, tang and wood screws you finish up with. That way, you stand a better chance of not boogerin’ up the slots later! You can either oil harden them by red heat and dip in oil, or red heat and dip in Cherry Red for super durability. Business Hours: Mon-Fri 9am-5pm Mountain time. Phone: 208-397-3008, Toll Free: 877 397-3008 Fax: 208 397-3009. We are pleased to serve customers in the United States. For international orders, please give us a call. © Copyright by www.MuzzleloaderBuildersSupply.com, 2011-2017. All rights Reserved.